More info:Note. Prices dependent on cabin class and date.. Some departures run in the opposite direction. Also 330 Euro port fees to pay. Sail power has very obvious benefits, vastly reducing the carbon used in any form of travel. Although we cannot use the sails all the time and in all conditions, they do provide a welcome benefit. We will visit the turtle breeding centre where a great deal of research and conservation work has stabilised, and is now increasing, the population of green turtles that nest on the Guanahacabibes Peninsula. One of the key successes of this project has been to engage with the local community to help protect the turtles and their environment, and as a result poaching of eggs and turtles has been greatly reduced. We will visit several national parks, providing an insight into the surprising wealth and diversity of Cuban flora and fauna, and providing a vital income for the park authorities and the surrounding communities. We also have the option to visit the Cuban crocodile breeding farm, and to contribute to the survival of this Critically Endangered species. We will also have the chance to visit a local school and community museum, and also an artists community, providing both an educational experience for our passengers, where they will learn about real lives and people in Cuba, whilst providing them with an opportunity to put something back into their host communities. We rely heavily on small local businesses for providing local excursions for our passengers, providing an income to several smaller Cuban firms. 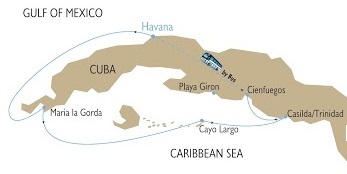 All the food on board is bought in Cuba; fruit vegetables, plenty of fish, meat and other staples are all locally grown and produced, and much of it is bought from small retailers or even directly from the grower or fisherman. Our vessel has an on board waste treatment system to avoid polluting the sea with waste. Furthermore, the smaller size of these cruise vessels and the smaller passenger numbers, ensures that any detrimental social and environmental impacts are minimised whilst allowing the passengers to visit smaller communities that don’t usually benefit from this form of tourism. Most tourists to Cuba stay (and often don’t leave) some large resorts in a few restricted locations, so by enabling our passengers to visit some different areas of Cuba without putting any strain on local amenities, we are spreading the financial benefits and the load of our visit. We encourage all our passengers to engage with the local community on a social and economic level to ensure that this tourism has a benefit to both the visitors and the hosts. The ship’s managers will buy as much of their produce as possible from local communities, and will also encourage our passengers to spend money in the communities that we visit. By trying some local fruit juice instead of a well known American brand of soft drink, you wull support the economy, it will be better for you and who knows, you might find you enjoy it more too. We will visit the Sea Turtle Breeding Centre and the Cuban crocodile breeding farm, both of which are making huge efforts to protect endangered species. We will endeavour to maximise the benefits of tourism and to minimise or eradicate any downside, socially, environmentally & economically. We will encourage our passengers to learn and understand as much as possible about the local traditions and way of life to enable them to appreciate the reality of life in Cuba.